Thanksgiving in Hawaii dinner scene. Vacationing during the holidays can often leave families uncertain of how to celebrate them. For those spending Thanksgiving in Hawaii, we have compiled a list of different events and dinners on each island. From the glittering North Shore to Waikiki, Oahu has plenty of Thanksgiving Day activities and outings. Start the day off with a Turkey Trot in Honolulu. Here, attendees can run 10 miles and burns calories in advance of Thanksgiving dinner. Another way to kick off the holidays is to join thousands at the Thanksgiving Weekend Holiday Parade. One option is pick up your own pre-made Thanksgiving meal. Places offering them include: Hawaii Prince Hotel, Hyatt Regency Waikiki Hotel, Pacific Beach Hotel or Diamond Head Market and Grill. Prices for take-out orders usually cost anywhere from $80 to $150 serving around 4 to 6 people. This can be a great way to enjoy a family-style meal in the privacy of a home, condo or hotel. Many restaurants in Waikiki will have a special Thanksgiving menu during this time. Some restaurants even cook the turkey in an imu, a traditional Hawaiian smoke pit. They will also make stuffing, desserts and side dishes with a distinct Hawaiian flare. Those in Waikiki can attend the gingerbread village unveiling at the Sheraton Princess Kaiulani. You can see the Waikiki Holiday Parade on the Friday after Thanksgiving. Here, there are crafts, foods and festivities to enjoy. Families can also go the Royal Hawaiian Center’s celebration featuring hula dancing, Hawaiian music and Christmas tree lighting. Ever thought about celebrating Thanksgiving in Hawaii on the ocean? If so, you should begin your holiday weekend with a cruise. On the Pacific Whale Foundation Thanksgiving Cruise, you can feast on classic dishes, while enjoying entertainment at sea. Aside from the many restaurants offering Thanksgiving menus, many can enjoy a feast at the major hotels. Popular Thanksgiving buffets and dinners can be found at the Grand Wailea Hotel. 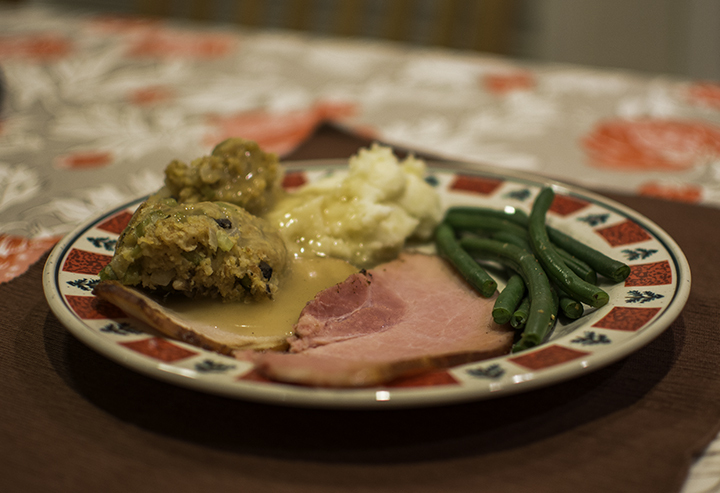 The Sheraton Maui in Lahaina also offers an excellent Thanksgiving Day meal. Similar to their Oahu and Maui counterparts, the Grand Hyatt Kauai and Sheraton Kauai offer Thanksgiving Day dinners. They come with favorite dishes like roast turkey and stuffing, baked ham, mashed potatoes, appetizers and dessert. Many hotels also offer a choice of fish as well as buffets with sushi stations. Recently, the Kauai Community College hosted a Turkey Roast by using authentic underground imu ovens. Here, guests could order Thanksgiving turkeys cooked the Hawaiian way. For details on restaurants with Thanksgiving Day menus, contact your hotel concierge. On such a vast island as this, there are innumerable opportunities where you can enjoy a Thanksgiving feast. Those renting condos can order take-out Thanksgiving meals and serve them in the comfort of their rooms. For guests who’ll dine at hotel restaurants, the choices are endless. A favorite option is the Hilton Waikoloa Village in the Water’s Edge Ballroom. Here, you can find a multitude of holiday dishes and live entertainment. Tickets range from $31 for children and $79 for adults. But there are many other restaurant options. The Mauna Lani Fairmont Orchard provides a decadent Thanksgiving Day buffet at $79 for adults and $39 for children. 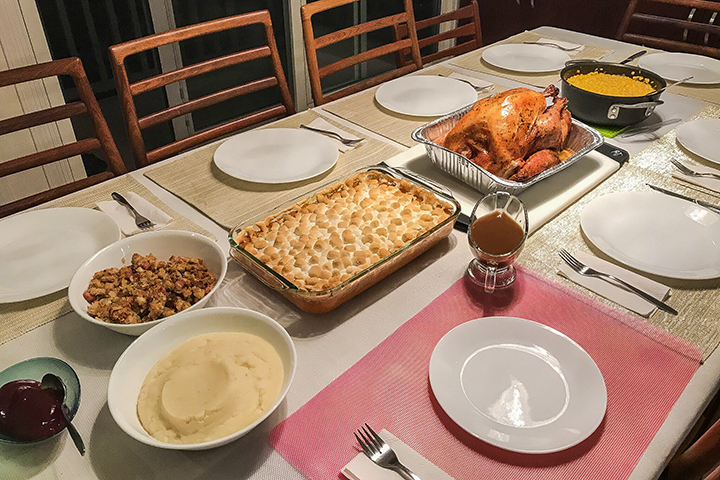 The Merriman’s in Waimea serves Thanksgiving dinners with Hawaiian dishes and desserts from $69 for adults and $30 for children. The Waikoloa Beach Marriot Resort & Spa features Chef Jayson Kanekoa’s ornate Thanksgiving meals. Here, he complements his meals with other delectable Hawaii-themed dishes. Example include lilikoi marshmallow covered yams, and macadamia nut and sage stuffing. Tickets are $30 for children and $69 for adults.